I have not finished a project in since the pink shell socks. Which is ok, I have been really busy in my life, and I have had less knitting time in Febuary than I did in January. But there has been progress. This project has stalled for three reasons. First, warmer weather. I started these when temperatures were hovering around 1o degrees F. Then we had several days in the upper 50's. Second, my hands are too fat. The mittens are just a bit to narrow to be comfortable. So these will probably end up going in the Dulaan box. Finally, I don't like working stranded knitting on the thumb. 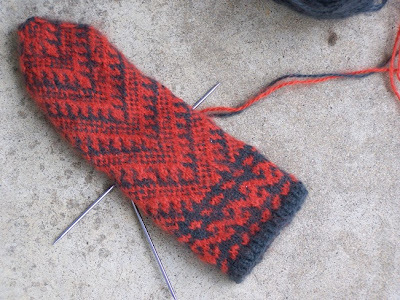 The thumbs are supposed to be knit in the same pattern as the palm. Is it too much of a cop-out to knit them in stripes or all gray? I would do the same if I were knitting them for myself. These are my version of Nancy Bush's Gentlemen's Plain Winter Sock from Knitting Vintage Socks. They will be for my husband. 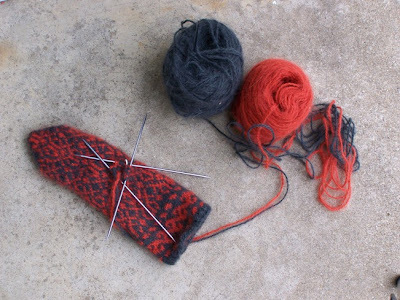 The first sock is a bit too short, so the toe will need to be re-knit. 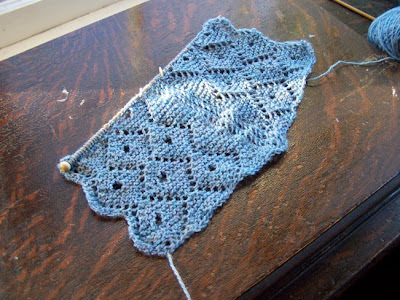 Swatch One: This is the lace pattern from the Clementine Shawlette on page 82. It is knit in Brown Sheep's Cotton Fleece on size 7 needles. An easy pattern to learn. 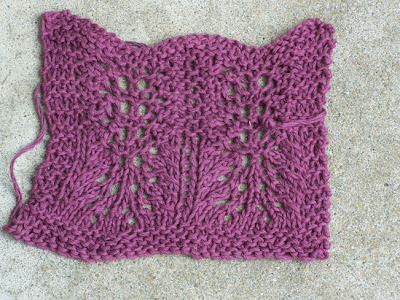 Swatch 2: Next up was the lace pattern from the Tea Rose Halter Top (page 80). 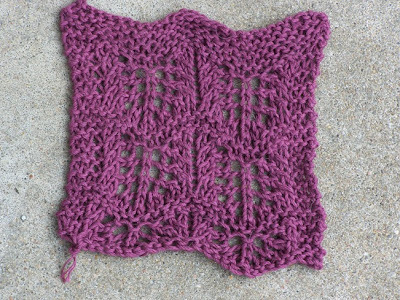 The top half is knit on a garter stitch background, then I realized the pattern was written for circular knitting, but I was knitting flat. The bottom half of the swatch is how the stitch is supposed to look, and I think it looks much better. This is knit in Classic Elite Miracle (50% alpaca, 50% tencel) on size seven needles. 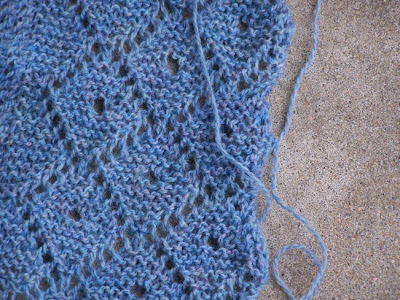 Swatch Three - Also from the spring issue of Interweave Knits, the stitch is one of the stitches used in the Rib and Lace Tank (p. 52). The yarn and needles are the same as swatch 2. 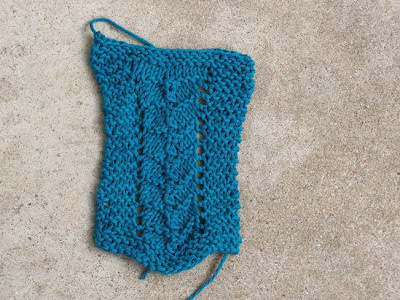 Swatch Four: Based on the Italian Chain Ribbing in Barbara Walker's A Treasury of Knitting Patterns (p. 47). The yarn is Brown Sheep's Nature Spun Sport and was knit on size 3 needles. 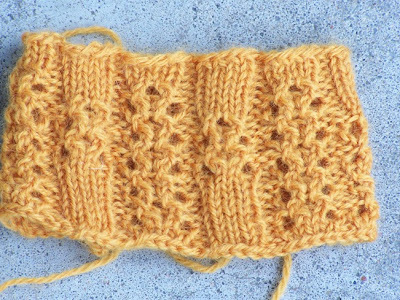 I am trying to design a pair of socks in this yarn (which is a beautiful golden orange color that did not photograph well). This is a case where I was glad I was knitting a swatch. Several mistakes would have frustrated me if I had been thinking I was starting a pair of socks. 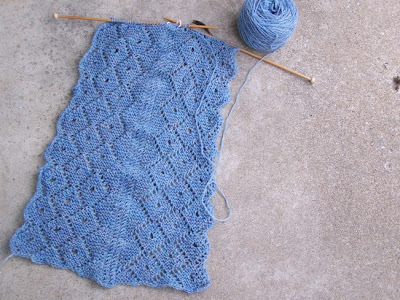 But as it was, I kept knitting and learned a lot from this swatch. Such as - while I like this stitch pattern, I don't know about it for these socks. The fabric expands out and is a bit loose (which Barbara did warn me about). Maybe if it were knit on smaller needles. It would also be good for scarves or blankets, as both sides look neat. It's not a reversible pattern, but the back side is also pretty (of course I did not get a picture of it). 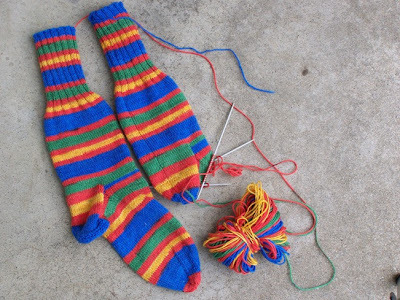 Wow, gorgeous scarf and amazing mittens, with fun stripey socks to go along with it! Such great knitting! All of your projects look so intricate and beautiful. Would you mind sharing the difficulty level of the pattern? I am seriously drooling over this one!